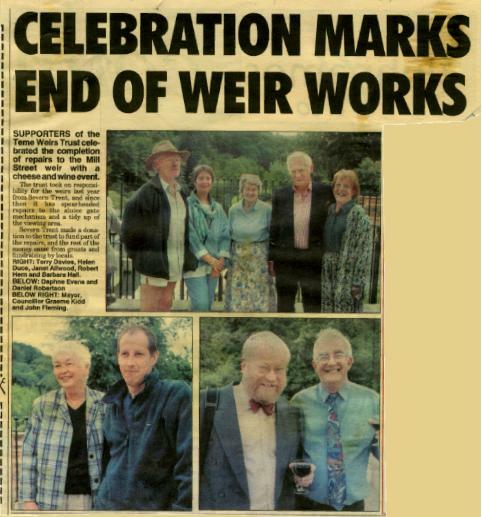 from the Ludlow Journal, July 2003, when the Mill Street Weir work was completed. In the mid 1990s the late Councillor and a Mayor of Ludlow, John Morris, of Ludlow Town Council, began to generate interest in a project to restore Ludford’s Horseshoe Weir and Casemill Weir on the River Teme at Ludlow. Councillor David Lloyd took over the lead, and in September 1996 a Public Meeting at the Assembly Rooms Ludlow was called to discover the level of interest in rescuing the two weirs. The meeting resulted in a full house with enthusiastic and overwhelming support for the restoration of the weirs. In October 1996 a Steering Committee of volunteers was set up under the Chairmanship of Tom Caulcott, by September 1997 Charitable Status had been obtained. Nine Trustees were selected by the Steering Committee led by Alan Poulton as the new Chairman. A volunteer project co-ordinator, Neil Aikens Bsc, was recruited and the South Shropshire District Council’s Conservation Officer, Colin Richards, was co-opted as a willing advisor. Trustee Daphne Jones chaired the fund-raising sub-committee and organised, together with a small band of dedicated volunteer helpers, a series of fund-raising events to finance the day-to-day expenses of the Trust, match funding for grants and to build up a reserve of funds for completing the necessary work. The Objectives adopted by the Trust were to restore and maintain the Weirs, to protect the rivers ecology established over 800 years and to enhance cultural, historic, scenic and recreational elements enjoyed by local residents and visitors. • An application was made to Heritage Lottery who requested a Feasibility Study and an Environmental Impact Assessment. A Grant of �27,900 from Heritage Lottery Fund was received towards the �32,000 cost. Additional funding was received from Shell Better Britain, Ludlow Town Council and public donations. • The Trustees agreed the recommendation to appoint Pell Frischmann (formally Flynn & Rothwell and De Leuw Rothwell) as Consulting Civil Engineers. • The Environmental Impact Assessment included geology, mammals, fish, birds, flora etc together with an underwater assessment of the Horseshoe and Casemill Weirs. • The completed Feasibility Study needed approval by both Natural England and Environment Agency before being considered by Heritage Lottery. This achieved, a full application was made to Heritage Lottery and Biffaward which both proved successful. In order to achieve a Biffaward it was necessary to become an environmental body (Entrust). • Ludlow Civic Society, Ludlow Town Council and public fundraising provided additional funding. • Specifications and full drawings for both weirs had to be submitted to South Shropshire District Council Planning Authority for approval. • This obtained, C. J. Pearce was selected from 5 contractors to undertake the restoration of Horseshoe Weir. To arrive at the point when work could commence on the first weir Trustees attended seminars and meetings with Heritage Lottery, Environment Agency, National Fish Pass Group (EA), British Canoe Union, Natural England, Shropshire Wildlife Trust, Planning Committees together with weir owners and solicitors to obtain formal leases for the weirs. The success of these projects has been due to concerted efforts from all concerned, in particular by the Chairman Alan Poulton MBE. He has been ably shadowed by his vice-chairman, David Riley who has always managed to lighten some of the most difficult hours, and by Daphne Jones with her bottomless purse through the generosity of so many local residents. Engineering support has come from resident engineer Mike Collins and consultant Paul Webb, Colin Richards, South Shropshire District Council’s Conservation Officer has provided massive support. Having achieved our initial objective the task ahead is to manage and maintain the weirs and sluices and Gareth Thomas as weirs manager is invaluable in this respect. In 10 years well over �1 million has been raised and spent through hard work by the Committee. The restoration is much applauded and appreciated so the task now is to see that Teme Weirs Trust is kept financially healthy to secure the future. Our thanks go to all the people too numerous to mention who have contributed to this successful project, for supplying information on specific subjects and giving many many generous donations of money and time. Special thanks to the people of Ludlow without whose encouragement and enthusiasm this project would not have commenced or been completed.